Here we will make a comparison between the expensive when send money trough bank transfer and when send money with online wallets. Please note that bank fees can vary quite a lot depending on the given country and if you send money domestically or abroad. Generally, let us say that we want to send $500 to a friend in foreign country. If we transfer the money bank to bank the fees will be between $30-50 and also if the bank accounts are in different currencies there will be exchange fee so totally out of $500 you will pay the banks $50-100. Which means you will loose more than 10% of your money. Also you will need to input correctly all the bank information - full name, bank account number (IBAN for Europe), bank name, bank address, bank code (most commonly SWIFT code) and so on. Also it will take a few business days to process the transfer. On the other hand you can very easily and with the same security and confidence you one of the online wallets to do the same operation at far less cost, time and effort. 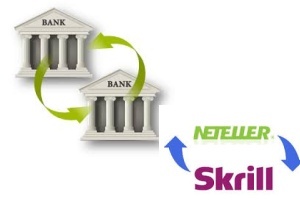 We recommend you Skrill and Neteller which are licensed and financially regulated institutions. You can upload money to your online wallet account from your bank account free of charge, for for a small fee from a bank card or local payment solution. You can transfer the money to your friend abroad for 1% fee (in our example 1% from $500 is $5) immediately (even on holidays) only knowing the recipient's email. Your friend abroad can withdraw the money to their bank account or VISA card for a small fee app. $4. Or if they have a plastic card which both companies (Skrill and Neteller) offer they can go to the nearest ATM and just withdraw the money with the standard tax. OKpay is one of the most reliable online payment wallets. Its functionality includes upload and withdrawals to bank card, SWIFT transfers and even bitcoin trading. They have very good referral program with 2-Level System. Don't miss out on your chance to earn up to €500.00 EUR per each referred user! OKPAY features an excellent 2-level referral system available both to business and individual users (see the Referral Tree graphics). or individual, having an OKPAY account. directly invited to OKPAY by you. to OKPAY by your first-level referral. Suppose your 2nd-Level Referral makes a €500 EUR transaction. For this transaction you, as the initial indirect referrer, will receive 10% of our service fee, i.e. €0.25 EUR in your account! In a similar fashion, if the same operation is performed by your first-level referral, you will receive 20% of the fee, i.e. €0.50 EUR will be deposited to your account! When your first-level referral orders a card via courier, you will immediately receive $3 to your account. 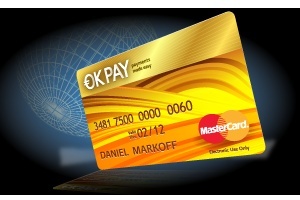 And after the card is activated, every card load by this user will instantly put $0.20 into your OKPAY wallet. Suppose one of your 1st-level referrals makes a $300 USD deposit in one of e-currencies – you will immediately receive 0.5% of this amount, i.e. $1.5 USD. After a while, this user decides to move this money to a bank account. In that case, you will receive $1 more. They offer 4% interest rate on annual base for the money you keep in your account. Also they have prepaid cards so you can access your balance immidiately. You can open an account on www.perfectmoney.is - HERE.